Check this out… my first (but not last!) 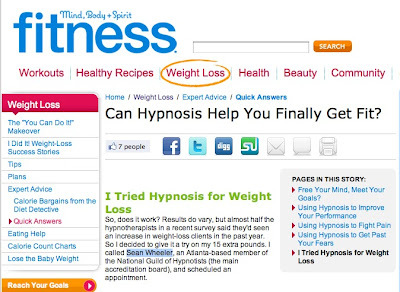 mention in a national publication spreading awareness about the benefits of hypnosis. This brief article was written by a woman who came to see me for three sessions a while back. She had modest goals – lose about 15 pounds – and had already lost about half that by the time she wrote the piece. Notice that she wasn’t perfect after being hypnotized… she made mistakes! That’s normal. The difference is that the mistake doesn’t lead to feeling disheartened and giving up. I teach my clients to learn from their mistakes and make FEWER of them as time goes on. That’s how I’ve been able to help my clients lose 20-50-70 pounds over the course of many months. FREE Stop Smoking Event – How To Sign Up!